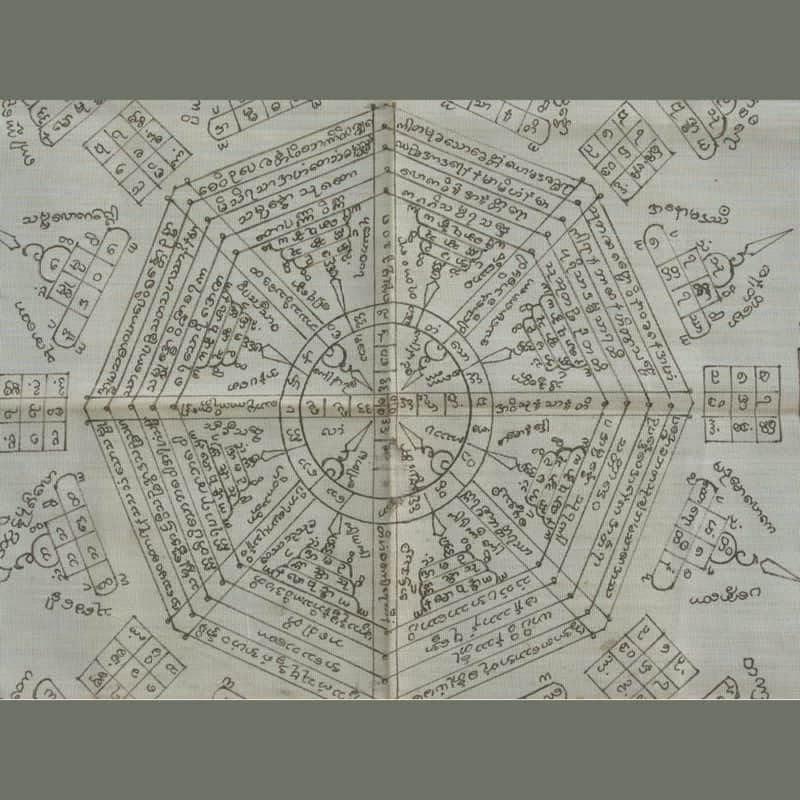 ‘Yantra’ is a Sanskrit word, and the name given to diagrams which act as representations of the divine and as aids to meditation. 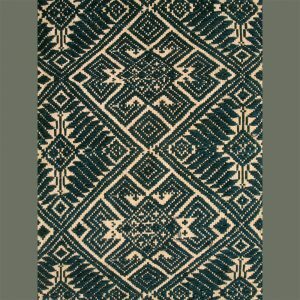 Symmetrical, but lively, this yan is drawn on a loosely-woven, stiff cotton. 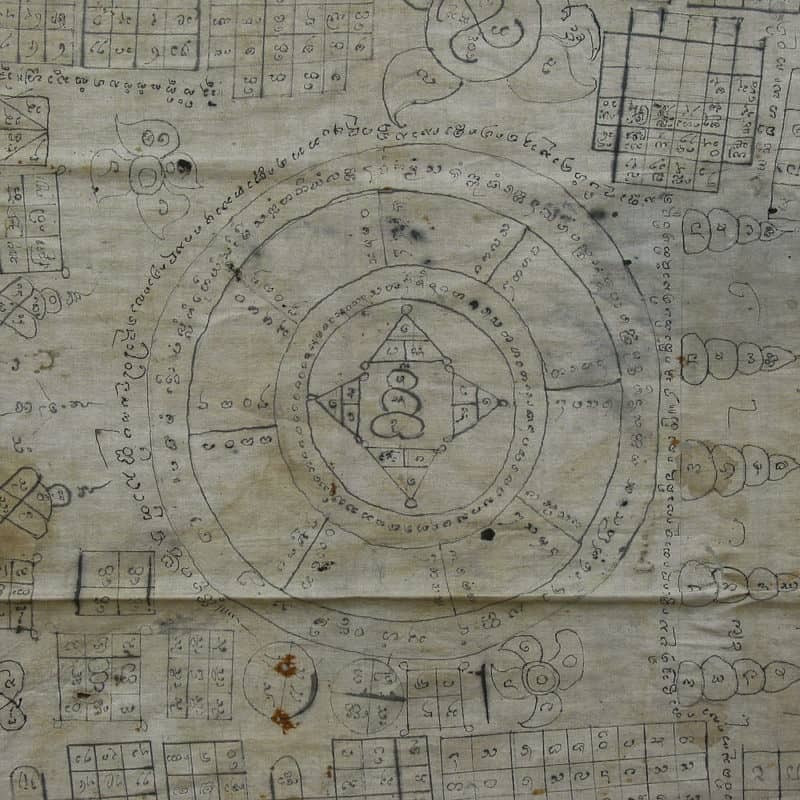 The design is an unusual combination of central mandala and free-floating outer yantra diagrams with letters and numbers. It would be very handsome framed. 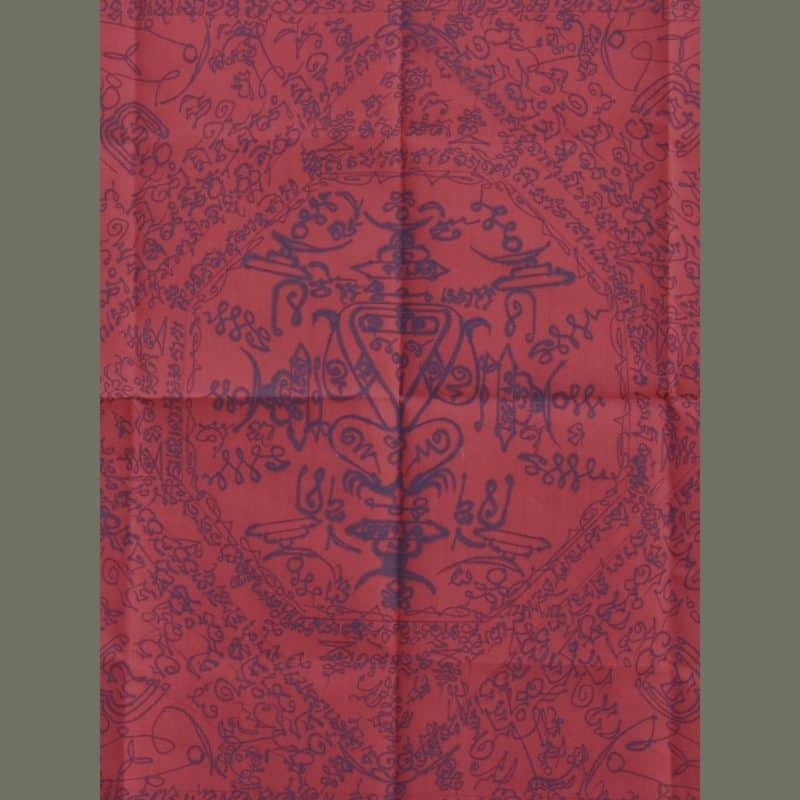 Very idiosyncratic, this panel is the size of a handkerchief and on bright red cotton. 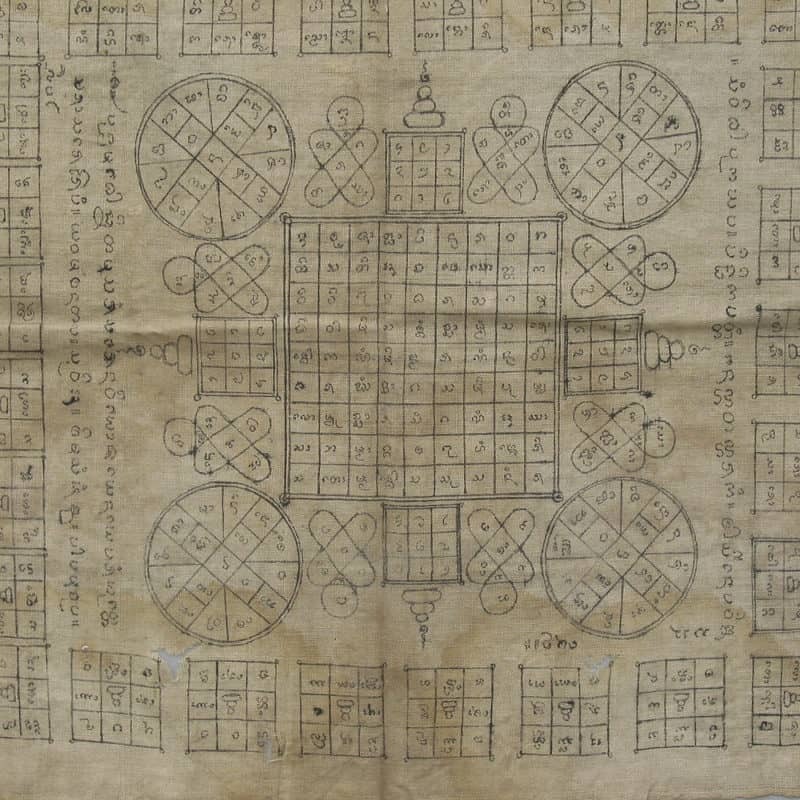 In the Lan Na language of northern Thailand, the inked inscriptions and figures are freely drawn with a looseness not usually seen in yantra. 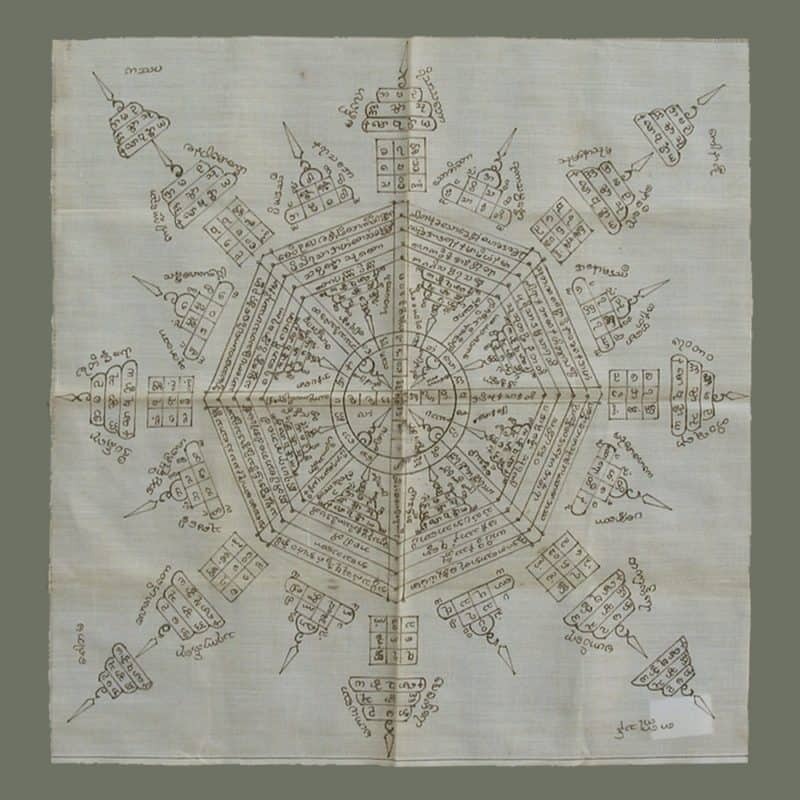 ‘YANTRA’ CLOTH: From our private collection, this came from a former tattoo master in northern Thailand. 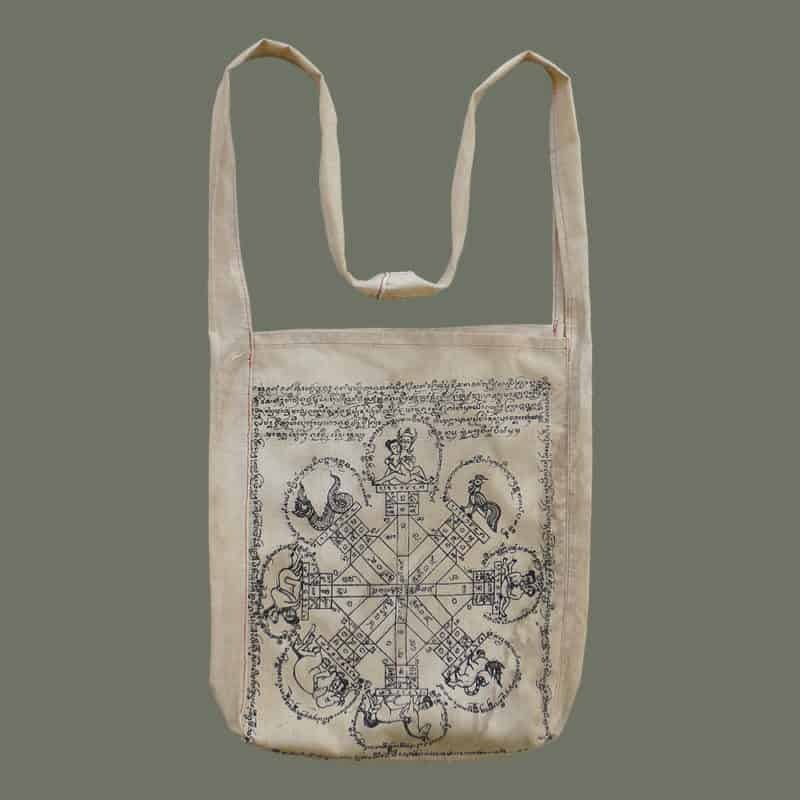 He could have used it several ways: it contains diagrams (‘yantra’) that could be tattooed; it could have served as a sacred mat on which to sit while undergoing the tattoo process; additionally it could have been also worn around the waist as a sash by the tattoo master. 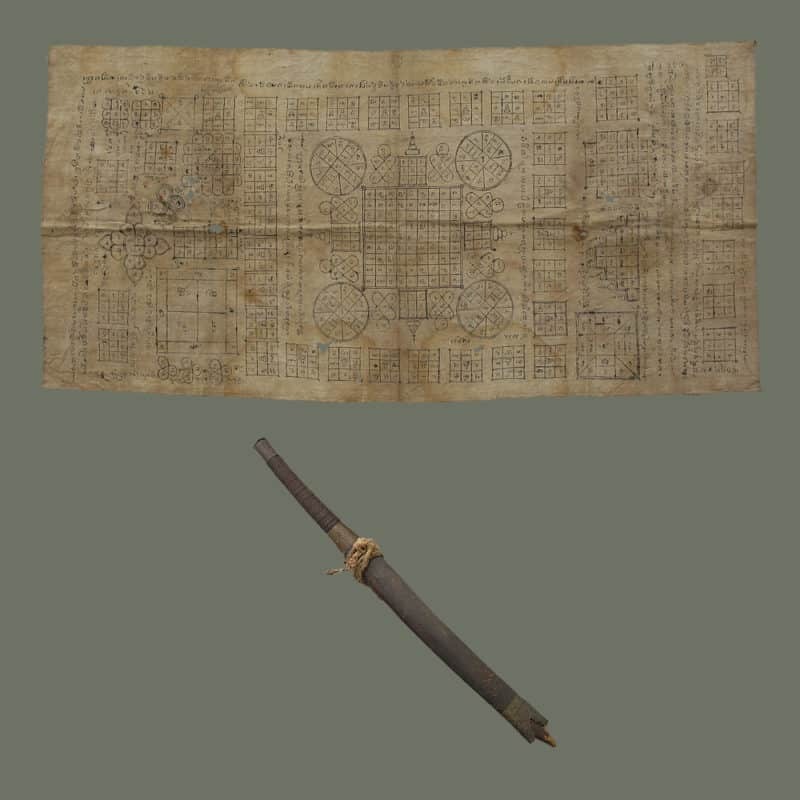 Generous in size, it is covered with hand drawn diagrams in many varieties, as well as text and symbols in the old Lan Na script. Our tattoo master was age 76 when he retired ten years ago due to failing eyesight; we’re told that he got this cloth from his teacher, another tattoo master. The condition reflects its age and use: there are some holes, stains (blood? ), and soil. 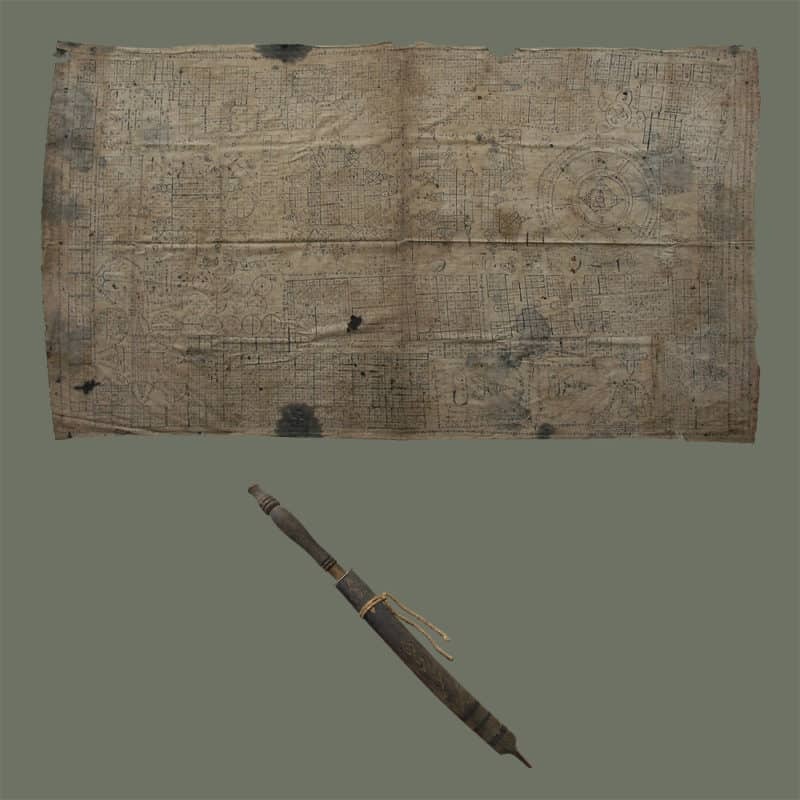 This is an authentic and rare textile with an interesting provenance. It is included with an old knife which was kept with it on a special altar when the cloth was not in use. KNIFE: This unusual knife was not used as a functional knife, but was a symbol of protection and invulnerability. Items placed on home altars are often left untouched for decades, and the condition reflects this. This short knife has a wood scabbard with painted decoration and a turned wood handle; the steel blade has rusted from lack of use. Cloth: 64 in. x 35 in. Knife: OA: 22.25 in. ; Handle: 6.75 in. ; Blade: 12.25 in. 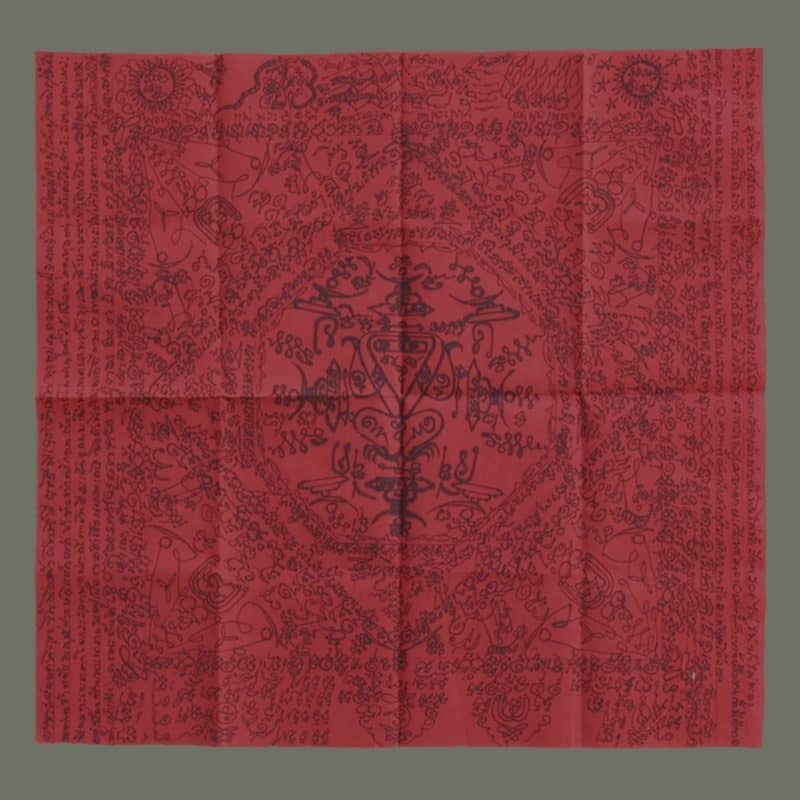 ‘YANTRA’ CLOTH: Collected years ago, and and only now made available, this special old ‘yantra’ cloth is from the home altar of a woman psychic in northern Thailand. 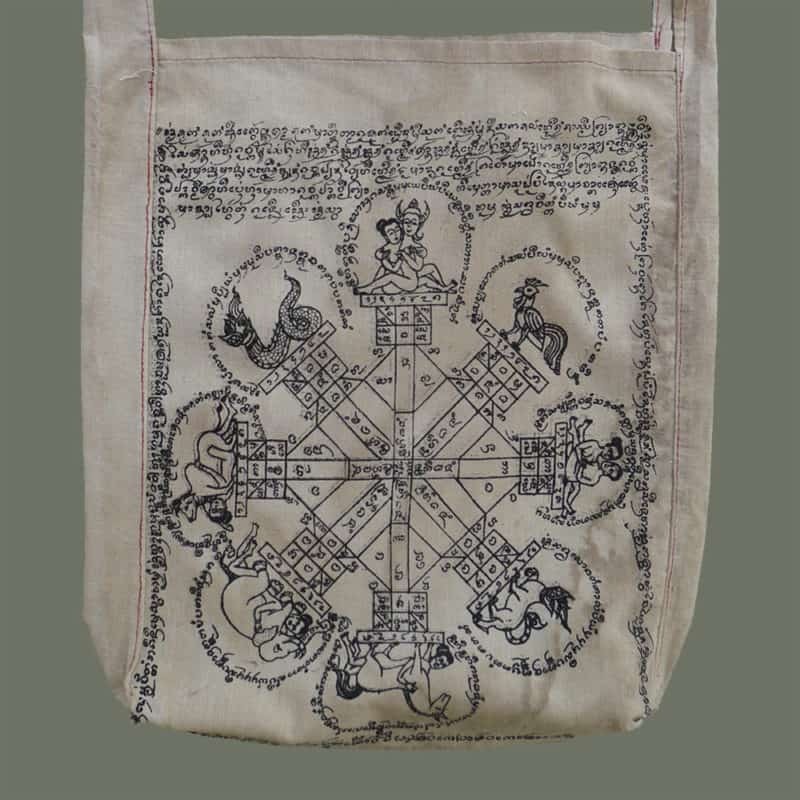 Made of handspun cotton, it has a variety of hand drawn diagrams as well as script in the old Lan Na language. As consistent with cloths we find on home altars, it is soiled and has holes, but overall, this one is in pretty good condition. 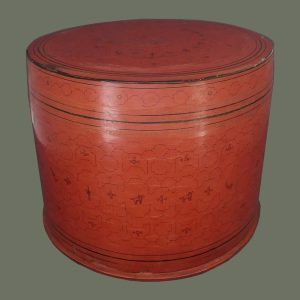 Such items are often left untouched for years and the condition reflects the circumstances. An old knife was also on the altar and is included with this cloth. KNIFE: Knives placed on altars are symbolic and not intended to be used for their original purpose. As such, condition is unimportant and reflects that they are often left untouched for decades. This one actually has a sharp blade, but is beginning to rust. An old wood scabbard covers it and is decorated with a piece of metal from another old knife. The handle is wrapped and finished in a traditional manner with old brass and twisted fiber. 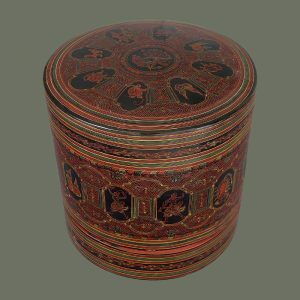 These are very special, authentic objects with an interesting provenance. We rarely get such items. Cloth: 44.5 in. x 22 in. Knife: OA 19.5 in. ; Handle: 6 in. ; Blade: 10.25 in.